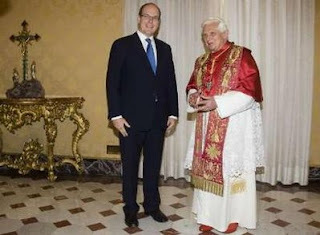 Monaco is on board with a plan to defend the Christian heritage of Europe. Metropolitan Hilarion, chairman of the Department of External Affairs of the Moscow Patriarchate, proposed the constitution of a “strategic alliance between Catholics and Orthodox” to defend the Christian traditions of Europe “against the secularism, liberalism and relativism that prevail in modern Europe”. The Russian Orthodox Church is not known for vague statements. This was prompted by the ruling last November against the display of crucifixes in Italian schools by the European Court of Human Rights. This has led to a coalition of some 20 countries from across Europe, Catholic and Orthodox, united in defense of the crucifix as a vital symbol of the religious heritage of the continent. Among those 20 is the Principality of Monaco which, while certainly allowing freedom of religion, recognizes the Roman Catholic Church as the official religion of the country as it always has been. The ruling about crucifixes in Italian classrooms has taken on a much broader significance as people on both sides of the issue have seized on it as a symbolic struggle in the growing trend of secularization across Europe. Opponents of the ruling say that, since the court deemed that the state must be confessionally neutral the court effectively ruled that, regardless of history, heritage or the will of the popular majority, Europe must be entirely secular. The ruling means, rather oddly, that regardless of the democratic process any European country must be totally secular in order to be democratic. Supporters of the crucifix ban say that this issue is simply about religious freedom (the original lawsuit was brought by a Scottish convert to Islam living in Italy who objected to the presence of the crucifix in classrooms). However, while traditionally Catholic countries like France have officially become totally secular the neighboring Principality of Monaco has not and yet both have complete freedom of religion. The Principality of Monaco was among the first ten countries to object to the court ruling alongside Armenia, Bulgaria, Cyprus, Greece, Lithuania, Malta, Romania, Russia and San Marino. Later on ten more countries; Albania, Austria, Croatia, Hungary, Macedonia, Moldavia, Poland, Serbia, Slovakia and the Ukraine have also joined the opposition to the ruling. Obviously, this opposition cuts across the traditionally deep divisions between Catholic and Orthodox countries, united now in common defense of the Christian heritage of Europe. With Italy, almost half of the founding nations of the Council of Europe have now voiced disapproval of the secularist policy. Prince Albert II has not been totally uninvolved in the campaign for closer ties between the Catholic and Orthodox communities. Regular readers will remember the Sovereign Prince awarding His All Holiness Ecumenical Patriarch Bartholomeos I for his efforts in this regard. Most encouraging.May God bless your highness.